The Original Cincher Back Support, by Jobst, is a device to help support the core and align the spine. Made for a women's form, the back support has many features and sizes to be worn daily to help protect the back and spine. The Original Cincher is a patented design with a multi-strap configuration that cinches the back and waist laterally, while providing a vertical support that follows the spine. 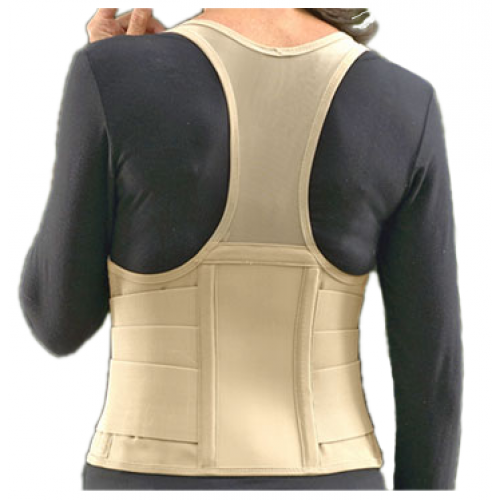 This Jobst back brace covers the torso and has straps that go over the shoulders, similar to a tank top. It comes with high-density Power Mesh with hourglass shaping. The support has wide elastic triple side pulls and vertical support elements that add compression to those areas on the female form that are the most sensitive to stress and damage in the lower back. The Cincher emphasizes spinal alignment through compression to the abdomen and lower back. It features adjustable shoulder straps, adjustable front closures, and flexible spiral stays. It is available in tan, black and white as well as in seven different sizes. The support has multiple straps for the most comfortable adjustment. The design helps protect a back from overflex and injury. The brace is made for the female form. The support is both horizontal and vertical with side straps and a vertical spine support. It comes is a wide range of sizes for the near perfect fit. What does the front of this brace look? Is it like a tank top in front? The support has a tank-top styled front.